SA2020 is data-driven and people-powered. We believe in transparency, accountability, and our community. We report on community indicators – 59 of them to be exact – and we use those indicators to drive community action. See them at SA2020.org/progress. 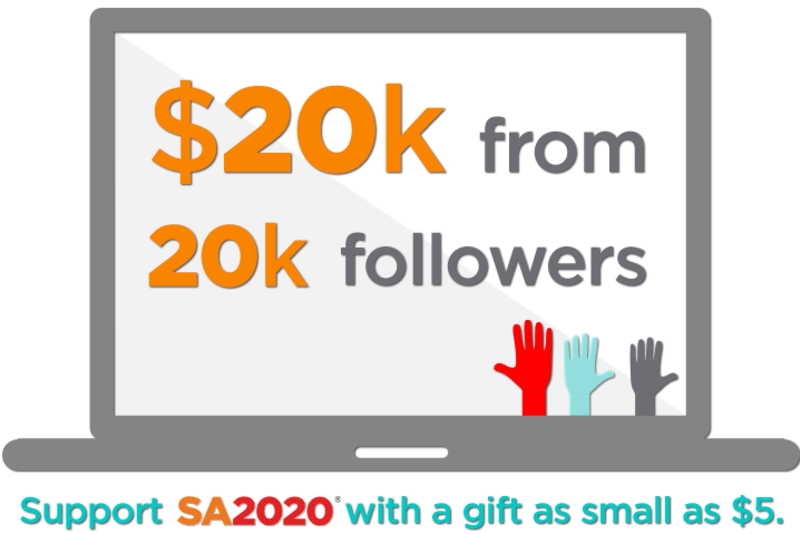 We connect the community for a stronger San Antonio and are so happy to celebrate 20,000 connections on Twitter! If you're connected with us, we hope you'll help power our work with a donation as small as $5. Your gift will help SA2020 transparently share information, support Partner nonprofits, and foster collaborations in San Antonio. It will also help support new projects, like ilovesanantonio.org—a website we've just launched to connect San Antonians to voter information and resources. If you follow us on Twitter, please let us know your Twitter handle at the end of the donation process! We want to give you a shoutout.